This coming Saturday I am having a few friends over for a game. The anniversary of Frederick the Great’s defeat at Kolin is on 18 June ( wasn’t there some other bit of a skirmish on that same date sometime?) so it seems like a good choice of game. 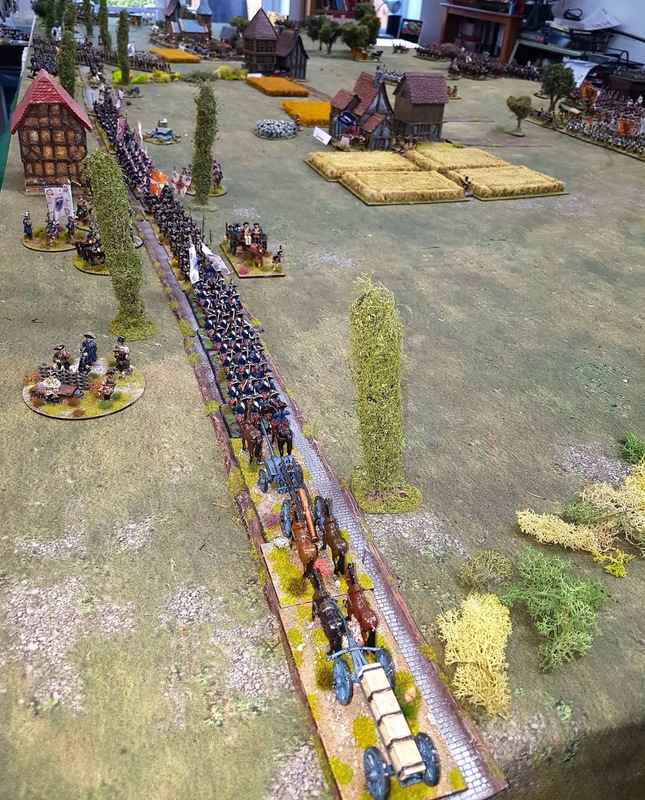 The Prussians on the left attempting their outflanking march. I’ve fought this battle twice or maybe three times in the past and the Prussians have yet to win, although they’ve yet to do as badly as in 1757. The game is based on my interpretation of the battle with bits gratefully borrowed from several other gamers’ versions of the battle, including Charles Grant, Jim Purkey and Jim Roach. The armies are scaled down to roughly 1:3 for infantry battalions and 1:5 for cavalry squadrons. The table is 6' wide and 13' 6" long (why? ), and looking at it from afar it doesn't look as crowded as I thought it might do. Far from it in fact. Anyway, it'll be a good test to see how long it takes someone to loose eight cavalry regiments! I think everything is set and ready for Saturday, and I'm looking forward to the day, and the game of course. 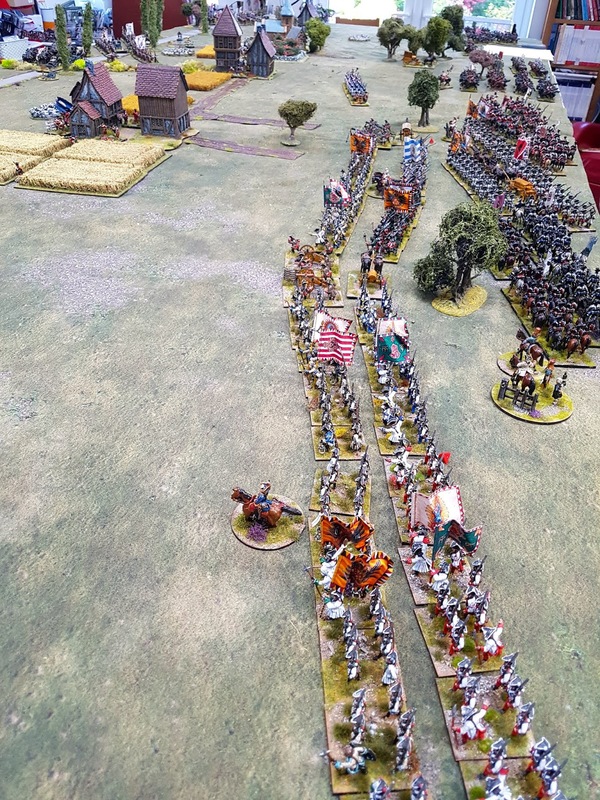 With three Prussian players and four Austrians it should be good. With a bit of luck we'll be able to have the doors open to keep the room 'fresh'. Then, after the game it'll be time to sit down and watch the England rugby team take on South Africa in the second test match of their tour. Table looks great. Have fun! Good looking game table. Go Prussians! I also like the picture of your game room. Thanks Chris. I look forward to seeing the new painting. Looks great Colin. Is that a TinyWargames cloth? Thanks Neil. yes it's a Tiny cloth. I have a couple and they're great. Game is a stunner! 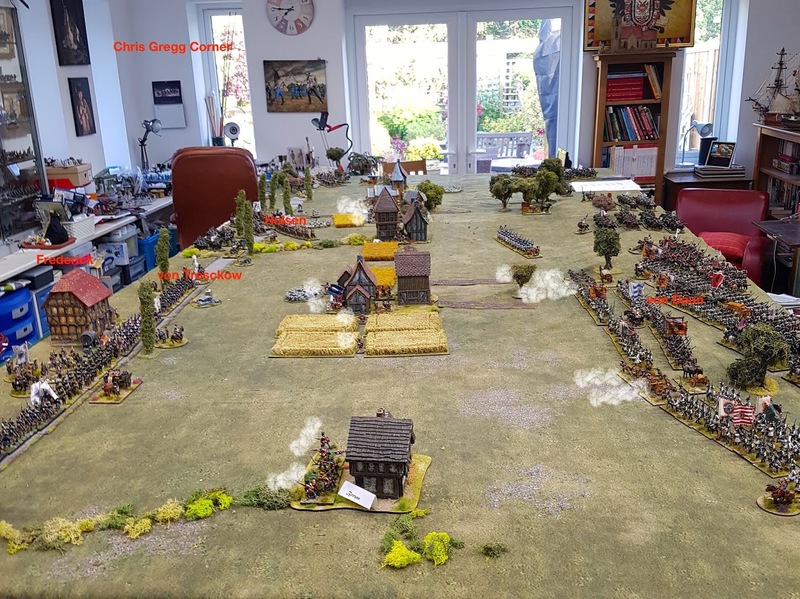 After three outings of Kolin on my own table, the Prussians still await the taste of victory.